Converting Outlook email to PDF is one of the safest ways of storing data contained in your email messages. There are lots of converters available online, but Total Outlook Converter is definitely the best. This program can convert hundreds of messages in less than no time and offers most flexible settings. to run the email converter via GUI or command line. How about attachments? Total Outlook Converter is powerful enough to process attached files as well. Typically attachments are saved to a new folder. They also get new names so that you knew which attachment belongs to which email. Zipped attachments can be unpacked. Images can be embedded into PDF copies. All output PDF will contain the info about attached files if you like. Some people prefer to save attached files in PDF too, together with emails. We offer a special Pro version that converts attachments to PDF file type. DOC, TXT, RTF, PDF, HTML, XHTML, XLS, PPT, TIFF, JPEG, BMP, PNG attachments can be saved as PDF. 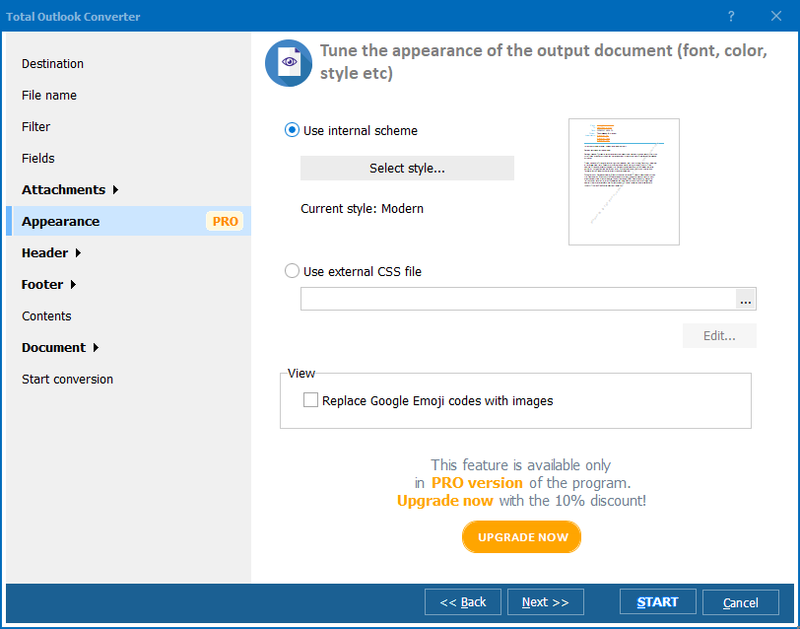 In order to convert PST to PDF, launch the program and select the folder with messages. Check one or more messages you would like to convert and select PDF. The program will do the entire job automatically. 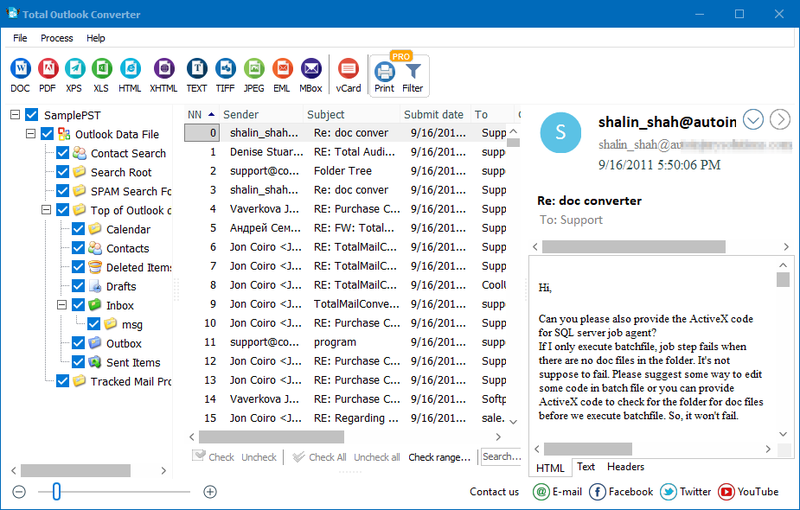 Total Outlook Converter offers 3 ways of fetching emails. 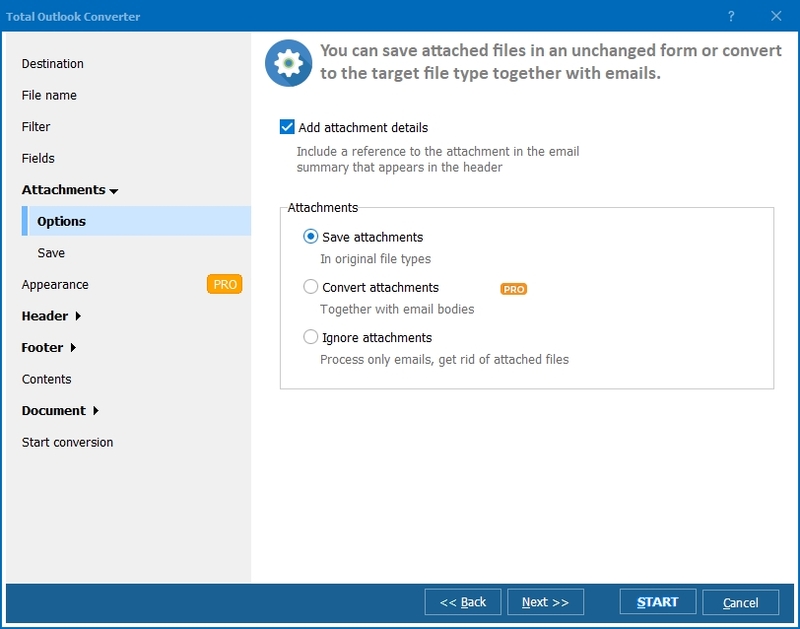 First, it can connect to your Outlook account and get emails from it (the originals will be kept intact, you will just receive PDF copies). Second, you can import any PST or OST file from your hard drive. Third, you can tell the converter to find the PST files on your computer. Total Outlook Converter has a GUI option and a command line option, which enables you to run the program from within other applications. There is also a special server version with ActiveX. You can either purchase the key right now or download the free trial version. Either you want to back up emails in a more sharable format or prepare them for a legal investigation, Total Outlook Converter is here to help you. Don't hesitate to contact us with any questions about the app. 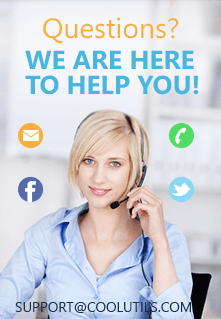 We will be happy to provide you with a reliable solution.